Enhance your Samsung Gear™ Circle listening experience by customizing the SoundAlive™ equalizer settings to best suit your musical taste. 1. Make sure your Gear Circle is turned on and in Bluetooth® pairing mode. Note: If your Gear Circle does not enter Bluetooth pairing mode, separate the earphones and press the Play/Talk key until the device vibrates and the status indicator flashes green. Pairing cannot occur when the earphones are connected to each other. 2. From the Home screen of your paired mobile device, touch Apps . 3. Touch Samsung Gear . 4. Touch Gear SoundAlive . 5. Review the notice about turning off sound effects in other applications and touch OK.
6. In the Basic tab, you can use the genre you listen to most often as the basis for your settings. 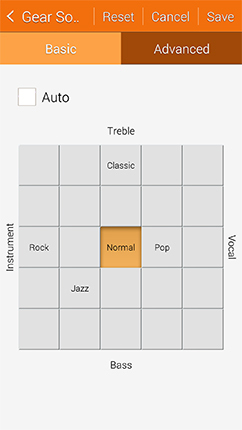 Touch the genre or another square on the grid that coordinates with the balance of Treble, Vocal, Bass, and Instrument you want. 7. To adjust the levels manually, touch Advanced. 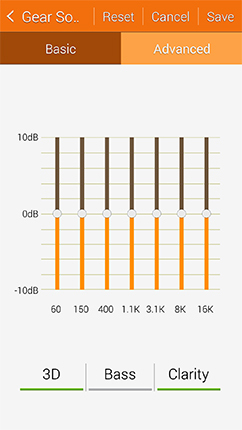 Touch and drag the sliders to create the balance you want. You can also touch 3D, Bass, and Clarity to enhance those features. 8. Touch Save to store your SoundAlive settings, or touch Reset to start over.